His very first swing set! A first swing set is a rite of passage in the life of a child. It’s the day they cross over from being a baby to being a boy. The day they trade their pacifier for a safety slide. The first day of the rest of their life. And today was that day for our son! If you’re in the market for a swing set, or perhaps you’ve already been there, done that, and just want to laugh at a first time parent’s experience. Either way. To all you parents out there who may think purchasing a swing set for your boy or girl is as simple as driving down to your local Babies R Us, picking out the best one, paying for it, sticking it in the back of your car, coming home, opening the box, and instantly transforming your backyard to a jungle gym wonderland, I’ve got some disappointing news for you. But this is your lucky day. I’m going to give all of your would be swing set buyers some helpful tips you won’t find in any new parent books. Oh, and keep in mind that this is my first ever swing set purchase which makes me super qualified to be giving tips. # 1 – Your car isn’t big enough. 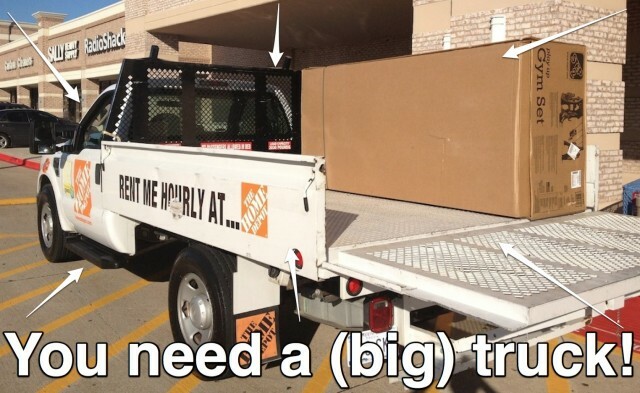 Unless you drive a huge diesel truck, you’re going to need a bigger car. We thought my wife’s SUV would do the trick, you know, as long as we folded the seats down. Guess what? Folding the seats down may work if you’re trying to bring home a Billy Bookcase from Ikea, but it’s not going to work if you’re trying to bring home a swing set from Babies R Us! # 2 However long you think it will take you to assemble, double it. Rest assured that it will take you all day to put this thing together, and you’ll need more than one person. Thankfully in my case my father-in-law (who is much stronger and manly than me in general) helped me put this thing together. Otherwise I’m not sure how it would have turned out. Actually when I say he helped me, what I really mean is I read the instructions, then handed him the tools and bolts needed to do the job. Sort of like what happens when you visit the Dentist. 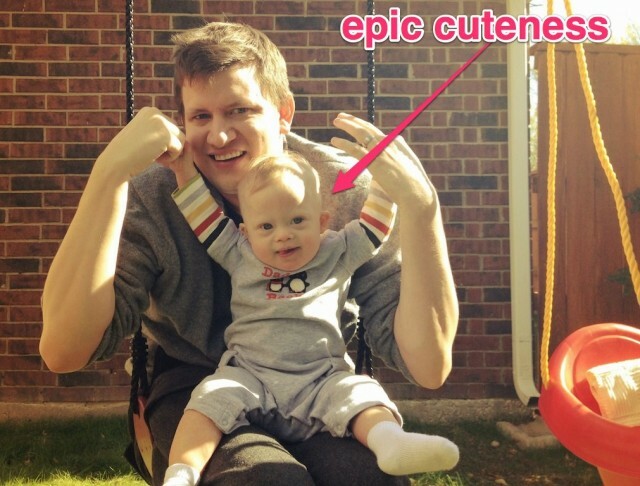 This actually wasn’t Noah’s first time on a swing though, that happened months ago. 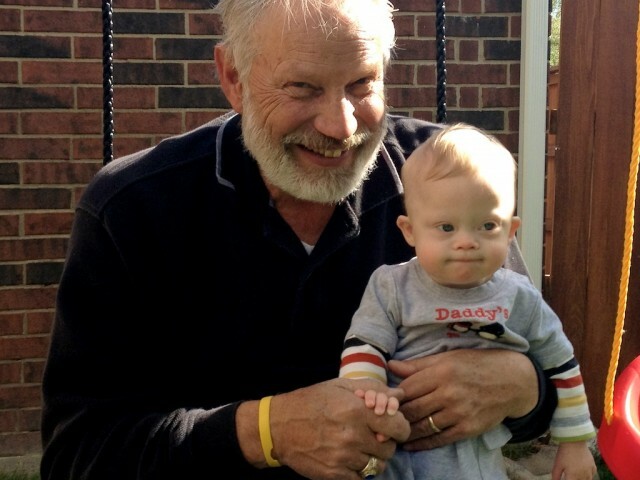 In fact, he has been using one at his physical therapy appointments since before he could sit up on his own, and we have another attached to our back deck (which is great for sensory integration.) He really enjoys swinging, and I enjoy seeing his face light up and hearing that awesome laugh of his as he flies through the air…so it’s a double win! And for parents who are raising a child with Down syndrome (like us) swing sets are a fun and cost effective way to work on some of those developmental milestones in the comfort of your own back yard. In addition to all of developmental benefits of the swing, the slide is great for helping children born with Down syndrome strengthen their abdominal muscles. The two swings that came in the box were just your typical swings, not the kind designed for a baby. And since we have a 10 month old that didn’t work for us. So we replaced one of the swings with the Little Tikes High Back Toddler Swing , and it worked great. It fits perfectly where one of the other swing would go, and we can swing along right next to Noah. On a side note we have the Fisher-Price Infant To Toddler Swing on our back deck (the one Noah in this video) and much prefer it to the little tikes one. One of the physical characteristics of children with Down syndrome is hypotonia, which basically means they have low muscle tone. 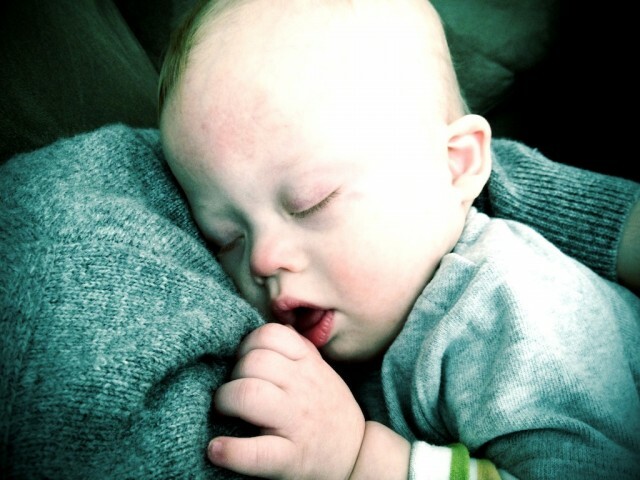 If you’ve ever hugged Noah you may have noticed how he just sort of melts into you. That’s hypotonia. (…and an extremely cute hug.) All that to say they can have a hard time holding their self up, and I think the Fisher-Price swing has much better support than the Little Tikes one. So if you’re looking for a swing, I’d suggest the Fisher-Price one. It’s great, and Noah has a ton of fun it it. Swinging Is Hard Work, But Somebaby’s gotta do it! Noah is finally holding his own bottle, which is a pretty big milestone in my book. Granted they may not be the big bottles (they actually look sort of like the ones that come with a girls doll, lol…) but he can actually hold it on his own! I know he feels a sense of accomplishment since it’s something he can actually do on his own, and that makes me one proud daddy. After his bottle his grandmother took over and read him on his all time favorite bedtime stories, Goodnight Moon (Although, The Tickle Monster ranks pretty high on Noah’s bedtime story list as well.) 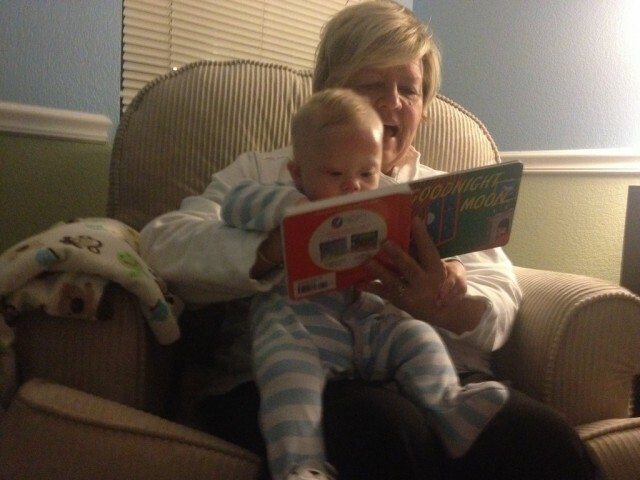 Noah’s grandma is a master storyteller, and could listen to her read stories all day (and night) long. He can't get enough Goodnight Moon....or his grandma. Moments like these are priceless. 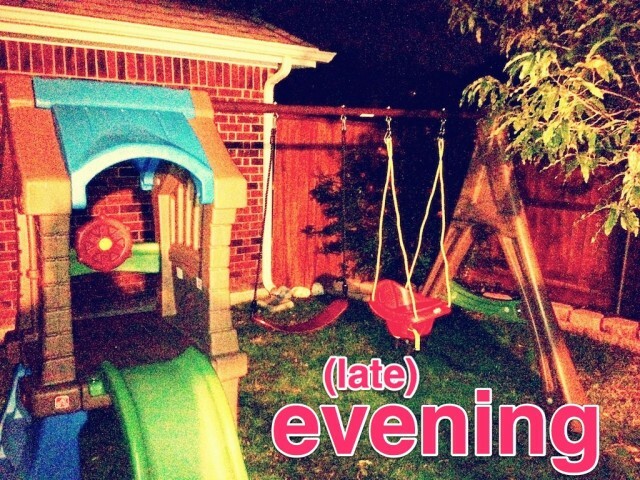 I want to hear your swing set story….keep reading…. Well, I hope my swing set tips are helpful to an first time buyers out there. Please take a second to leave a comment below and let me know if you’re planning to buy a swing set in the near future. 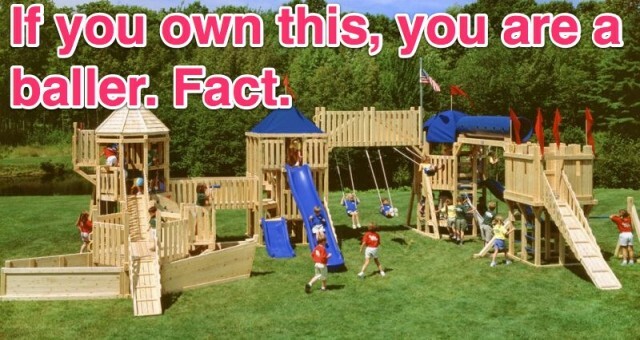 Or if you already own one, tell me about your first swing set buying experience. I’m going to take a shot in the dark and guess that there are some stories out there much better than mine. Like America’s Funniest Home Videos funnier. I want to hear about it. I wish we had a swing set. We haven’t bought one (yet)…we’re kind of waiting to see where Husband ends up for a job. If we’re here, we’ll buy a swing set for here. If we have to move, we’ll buy one wherever we move to (unless there’s one already there). So, job mojo first…..swing set later 🙂 But Little Man does love to swing. @openid-125572:disqus Yah, it’s not something you really want to be moving around..that’s for sure. Are you guys moving? What sort of work does your husband do? We got a cheap set from Walmart and bought a baby swing to attach to it. The set has a slide, three swings, a seesaw, and a glider thing. Caleb (3 yrs) loves every bit of it, and so do his friends. James loves his swing, and he can usually convince Caleb’s friends to push him. 🙂 Putting it together was definitely an experience. Jon plus two guys from our church. I was wise enough to stay in the front yard that day! @moira, How old is your daughter, and where are you guys from? I just love reading about Noah. You and your wife are such great writers, it’s almost liek witnessing it firsthand. 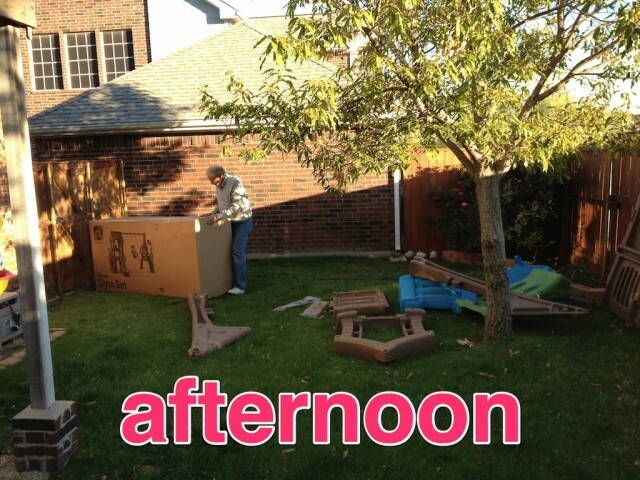 Loved that your father in law helped you, which was really you reading him the directions lol. Thank you for the kind words. We enjoy writing, and sharing Noah’s story with the world But the best part is all the great people (like yourself) we get to meet. Where ate you guys from? Do you have any children? If so, how old are they? LOVE the swings! @7b8354d76724cca0719a2146865ee62c:disqus They really helped my little client with DS make huge physical leaps this year. And the slide. She’s got abs of steel now! I’m so blessed to have a job where my mandate is swing on swings, jump on trampolines, slide on slides, and if there’s time- sing and colour. Enjoy your swing set Noah! Hi Rick! Love that you share all of your knowledge & resources! It has been very helpful to us! We just recently got our little guy the Fisher-Price swing. Hopefully it will be put up this weekend! Excited to see him in it! Like Noah, it’s not his first swing exactly, but at least now we can swing away at home and not just at PT! 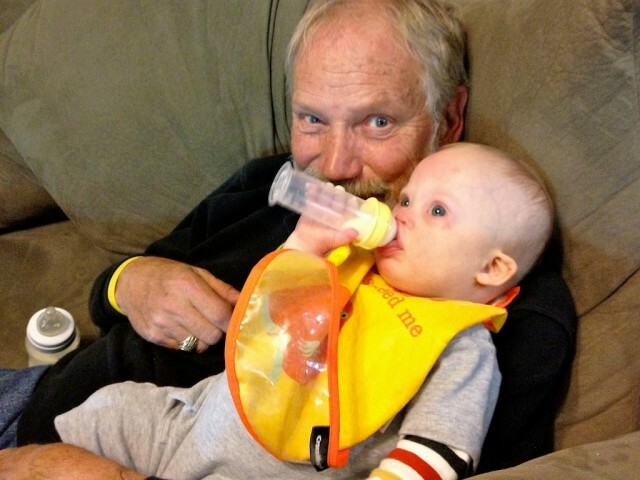 I had one other quick question – I saw that Noah was able to hold his own bottle in those pictures…do you only put a small portion of his milk in the smaller bottle, then refill it when he needs it? We are working on trying to get our little one to hold his own bottle, but the bottles are huge for his hands and I think it hurts his efforts…thanks for any tips!! Hi, your son is so cute, I love the pictures! My son is 8 years old and has Down syndrome and we are moving and can’t take our swing set with us. Which just won’t do because the swing is my son’s favorite past time. 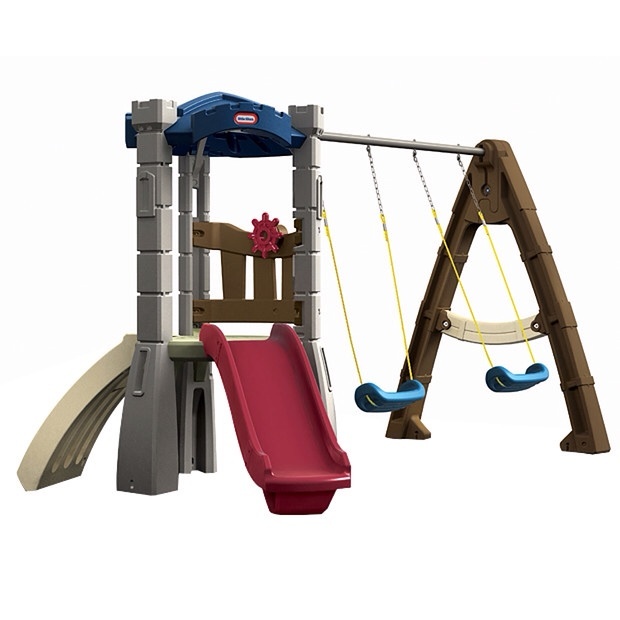 I was just looking on the web for sets for older children so we can buy or build a new one at our new house and I came across your site! Thanks for sharing! All the best!